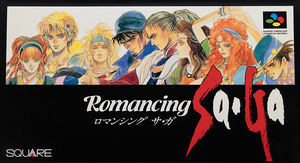 Romancing SaGa is set in a fantasy world where players must navigate their characters through towns, dungeons, and other environments while taking part in the game's story by interacting with non-player characters. At the start of the game, the player is given the option of assuming the role of one of eight main characters, each with their own strengths, weaknesses, and starting points throughout the game's world. In addition, the player must select the profession of the character's parents from a list of eight choices each, which go towards determining their strengths. As a staple of the SaGa series, both gameplay and story are largely open-ended, giving the player the ability to play through scenarios in a number of different orders, with some areas and portions of the narrative only becoming available once they have spoken to specific characters or performed certain tasks. By completing story objectives and meeting new characters, the player is brought closer to the game's end, leading to the final confrontation where they must use all of their acquired skills to succeed. The graph below charts the compatibility with Romancing SaGa since Dolphin's 2.0 release, listing revisions only where a compatibility change occurred. This page was last edited on 20 December 2017, at 05:00.